Looking for the ultimate covers band? 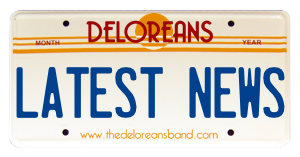 The Deloreans will rock any event, taking you on an epic and eclectic journey through the decades, from the 1950s to the present day. 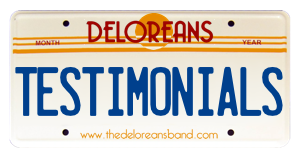 Guaranteed to get toes tapping and tail-feathers shaking, The Deloreans will bring excellence, energy, personality and professionalism to your party, wedding or corporate event. 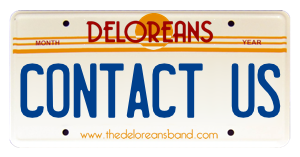 With powerful vocals, a tight band, and unique mashups & medleys, the Deloreans have filled dance floors for almost a decade. We’ve performed in a wide range of venues including Shepherd’s Bush Empire in London, Wiston House in Sussex supporting Bjorn Again, and even a mountain-top venue in Verbier, Switzerland. As well as the regular 5-piece line-up (vocals, drums, bass, guitar and keyboards), we also offer 6 or 7-piece line-ups which include saxophone and/or trumpet. If you need music for a drinks reception or wedding ceremony, we can supply chilled acoustic music (vocals and guitar). We can also provide a DJ – please contact us for more details. Thank you all for helping us to make the Love Ball a success. You were brilliant - perfect music for the occasion and just so tight musically. I've had great feedback about the band from dancers, non dancers and even people who weren't at the event. News spreads and that is exactly what we want... thanks again! The whole day went brilliantly and The Deloreans were a big part of that. So many of our guests commented on the night and since the day how awesome they were, and we loved them too. It was exactly what we were hoping for and topped off an incredible day. We particularly liked how the sets were put together (playing medleys rather than playing each track in isolation), and the roaming brass was a big hit! The dancefloor was full from start to finish, which says it all. What can we say - THANK YOU! You guys were absolutely epic, what a party. I knew you were good having seen you before but it’s even better when it’s your own party!! The dance floor was packed all night, my feet hurt from dancing so much and Martin finally lost his voice completely from singing along. We are so happy we went for the full band, we have received so many compliments from friends and family - many saying it was by far the best band they have seen at a wedding! Keep doing what you do - we loved it and so glad you made our wedding!! Wow. 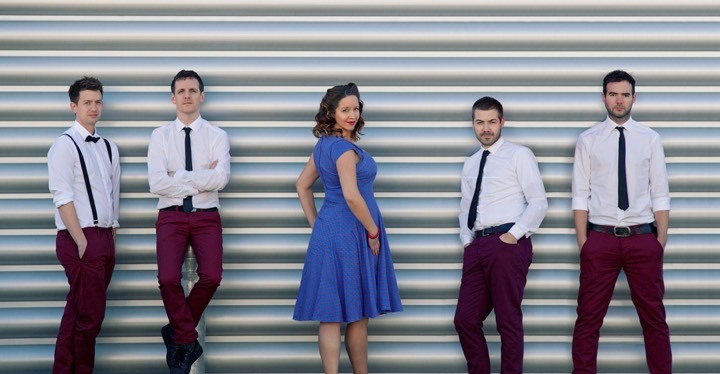 We could not have asked for a more perfect band to play at our wedding - all of our guests were blown away and have been consistently commenting that you are the best band they have ever seen. It was incredible! We had the best day of our lives and you were all such a huge part of that. I don't remember ever seeing an empty dance floor and have the blisters to prove it!! Just wanted to drop you a note to say thank you so much for Saturday!!! We had the best day and the Deloreans were just fantastic!!! Completely surpassed all expectations (which were pretty high after watching clips online) and we have had so many people singing your praises to us! Just a huge thank you from Kate and I for last night, we had an amazing time and you guys were completely fantastic- the music was absolutely spot on and it was great to see everyone getting stuck in! Hope you all got home alright and thank you so much for everything over the last few months of planning and of course for yesterday. I just wanted to say a massive thank you for Friday night – you did a fantastic job and the music was just perfect. The feedback from everyone has been so positive about you guys. We just wanted to say a huge thank you to you and the band. You guys were absolutely amazing and had everyone on their feet for the entire evening, from the 4 year olds to the 80 year olds. All our guests thought you were fantastic, as did Lucy and I, so thank you again for making our day extra special. Thanks so much to The Deloreans for Saturday night. You were absolutely fantastic! Everyone thoroughly enjoyed the dancing and you were non-stop talked about over lunch the next day. Thanks for making everything so easy and fun to organise. What a fabulous night! 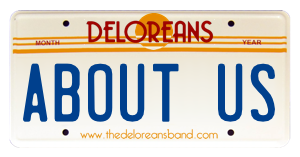 We chose the Deloreans to play at our wedding because they are simply the best. We wanted our wedding to be a day to remember and the band delivered – and then some…! With songs from the 1950s right up to the present day, there’s something for everyone in our setlist. Rock’n’roll, disco, pop, rock – if we think it’ll get you on the dancefloor then we’ll play it! We regularly add to our repertoire, but to see a list of songs we currently play, please click here. 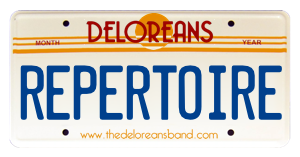 The Deloreans is at Farbridge. “Thanks for an awesome night. You were fantastic and the atmosphere was brilliant all night. We couldn’t have asked for more” - Charles. What a fabulous time! Thanks for keeping us all on that dance floor! !